CABIRIA: Kickstarter Campaign is LIVE! Raising funds for swag! Kickstarter Campaign is LIVE! Raising funds for swag! What a great day! In addition to launching the line and getting huge amounts of wonderful feedback and interest on social media platforms, we got approved for our Kickstarter Project! It's called Get Cabiria Plus Size SS13 Collection Into Stores and that's exactly what we plan to do. 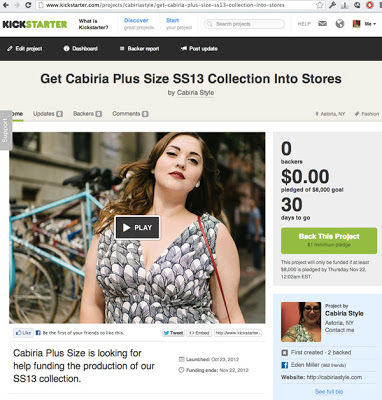 The web address is http://www.kickstarter.com/projects/cabiriastyle/get-cabiria-plus-size-ss13-collection-into-stores. Click on any of the links in this post or copy that link into your browser to be taking to Kickstarter's Project page. We have until November 21st - the day before Thanksgiving - at 5:08pm EST to raise $8,000 or we get nothing at all. What a challenge, but one I know we can meet. The $8,000 is to pay for grading (sizing up and down) costs for each pattern, factory productions fees (higher here in the US than abroad, but so important to keep skilled jobs local), shipping costs, website development, and marketing to let the buyers know about our SS13 line. If we raise more than $8,000, I have big plans, including expanding production abilities, printing our own fabrics, showing the line at trade shows, upgrading our website and e-store, expanding into new markets, and paying photographers, models, assistants and web developers, etc. a fair wage for their services. I NEED YOUR HELP TO ACHIEVE THIS GOAL!!! Please donate what you can; we have great incentives in the offer starting at ridiculously low pledge amounts, so that little drop in the bucket plus others makes for a huge flood. And even if you don't choose to contribute, please boost the signal by passing along the message to all your pals. Anyone who believes in equality entitlement, or body pride, or American small business entrepreneurship, or just beautiful clothes. Every ripple outward helps. I can't wait to see what's in store this month, and I am already so thankful!